Now you can have one piece of equipment that can handle most Pest Control Applications. We have taken our Versafoamer 4000 and combined it along with the Portable Aerosol System into one package. Saves you money over purchasing components separately. For Commercial Applications, you can use the Portable Aerosol System for general pest control, and then swap out the tank and have a power foamer, great for drain and fruit fly work. 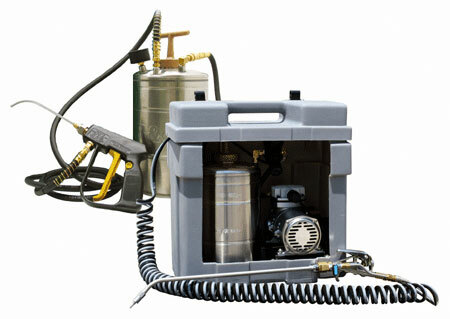 For General Applications, you can use the Portable Aerosol System for anything from Bed Bug Applications to crack and crevice work and then swap out the tank and now you have a power foamer, great for foaming wall voids for termite and carpenter ant control or other applications where foaming offers you advantages over conventional sprays. All this for a price less than a competitive Aerosol System! More information of the Portable Aerosol System. More information on the VersaFomer 4000. For over 70 Years, B & G has been supplying quality products for the Pest Control, Industrial and Retail Markets. We attribute our success to innovation, design, quality of construction and excellent customer service. Proudly, all B & G products are made 100% in the U.S.A. following the utmost in precision and quality. Please inquire for replacement parts availability. Copyright (c) 2017 B&G Equipment Company. All Rights Reserved.